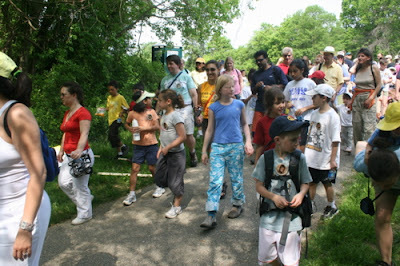 On Sunday May 12, approximately 115 people gathered at Lake Frank near Rockville, MD to participate in A Walk For Water. This event marked the culmination of several months of dedication by students in local Maryland schools and their communities to raise funds for Amman Imman’s project in the Azawak. We were fortunate to be accompanied on the Walk by a young Tuareg man, Attaher Mohamed, who grew up in the Azawak and lived the life of searching for water. Recently, Attaher discovered Amman Imman on the internet, as he was looking around for a way to help his people. Having him come to A Walk For Water and speak to the students and their families about life in the Azawak brought the reality of the struggles of the people there a little closer to us all. Early in the morning our team of volunteers assembled at the park. At the rally we talked about why we were walking, reminding students and families that our walk of 3.25 miles, crossing a slippery creek, symbolized the daily challenge that children in the Azawak make, as they walk 30 miles in 120 degree temperatures in search of a basic element needed for survival. We also congratulated the children on their efforts of raising funds over the last several months. By their actions they were making a statement that they were going to change the world. Now, by walking together their voice would rise louder, by their unity, to let the world know their committment to bring water to the people of the Azawak. We asked some of the students to stand next to Attaher, as examples of the power of unity, working together and making a difference in the world. And these students represented the hundreds of students around the world who are working to make life healthier for the people in the Azawak. 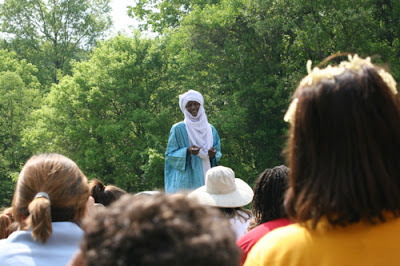 Attaher spoke to the crowd, re-emphasizing that the greatest need of his people is water, and thanking the students and their families for the help they are giving to the people of the Azawak. 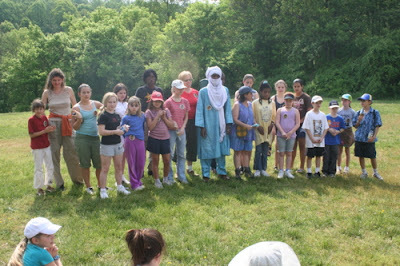 Thank you for coming together for "A Walk for Water" and joining in solidarity the children of the Azawak. Today, as you walk around the lake, your spirits will be united with the them as they too will be walking long distances in search of water. The people of the Azawak and team Amman Imman are so very grateful for your compassion. Thank you for keeping their plight in your heart and devoting your time and energy to help them. I wish I could be with you today as you walk for water. Team Amman Imman joins you in spirit. As we began to walk, Attaher led us. 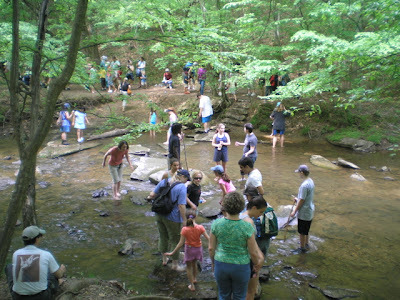 Everyone helped each other across the stream. As each child completed their walk they were congratulated and received a certificate signed by Ariane Kirtley, founder and director of Amman Imman and Michael Kirtley, president of the Friendship Caravan, that named them "an agent of world transformation and a friend of the Azawak". 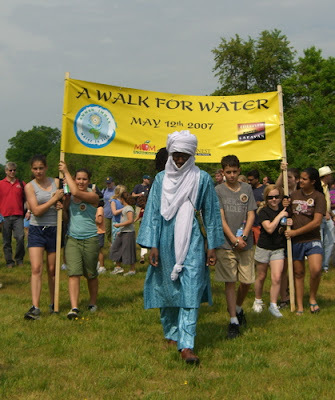 Many thanks to the students, families and volunteers from the following schools who participated in A Walk For Water: Oneness-Family School, Barrie School, Evergreen School and Monocacy Valley Public Charter School. And a very special thanks to the students who collected sponsorships for every mile that they walked. 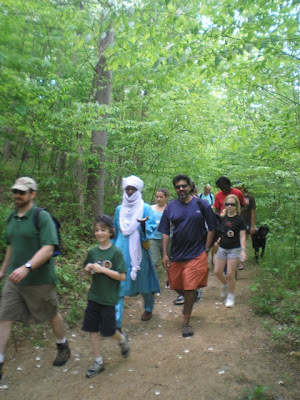 Because of your efforts $6185 was raised to support Amman Imman's work in the Azawak! 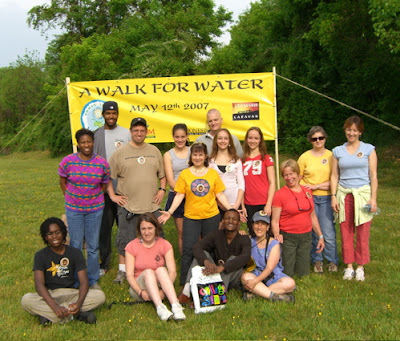 To view a video slide show of a walk for water, please go to the idisk by clicking here ( password=educakit).